Whether you’re planning an outdoor adventure or preparing for an emergency, one of the best things you can do is find a great multi tool. They give you just about everything you need in a small, compact package. There are a lot of things to think about when choosing the right multi tool so we did a lot of research and put together this guide for you. First, here are the features you should know about before you choose the right tool for you. Functions: Something important to point out here is that the number of functions a multi tool isn’t necessarily the same as the number of tools it has. Some of these designs are so smart, one tool provides multiple functions. Stainless Steel: Stainless steel is one of the best materials for these tools. It’s durable and won’t rust or corrode. As you can imagine, in an outdoor survival situation, it’s important to have a tool that stands up to the elements. Color: Most of these tools are either silver colored stainless steel or have been treated with a black coating, usually black oxide. The handles vary a lot, though. Most of black but there are also bright green and wooden options as well. Carrying Pouch: Having a carrying pouch is really convenient to keep the tool safe when it’s in storage or during travel. More importantly, though, most pouches or sheaths allow you to attach the tool to your belt so it’s always handy. Size: Some of these are 3 or 4 inches. The largest we found is over 11 inches. Do you want something you can attach to your keys? Or are you going to keep it in your tackle box? Remember, smaller equals more portable. Warranty: While some of these products didn’t offer any warranty information, a lot of them come with pretty impressive warranty terms. Our picks’ warranties range from 1 to 25 years and even include some lifetime coverage. Now that you know a little more about what to look for, let’s move on in our best survival multi tool guide to our favorite products. Here’s the deal, our top and budget picks are up first so start there if you’re running short on time. They really show you the range that’s available. Stick around if you can, these tools are all so unique, we know you’ll find what you’re looking for. Now, let’s move along into our reviews. 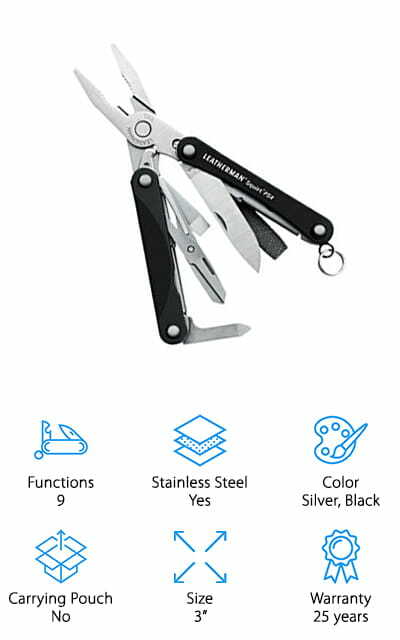 Our pick for best survival tool is the Leatherman Squirt PS4. With this tool, you’ll be prepared for just about any situation. It includes 9 different tools: a knife, pliers, screwdrivers, tweezers, wire cutters, scissors, a bottle opener, and a file. And get this: you only need one hand to open and operate any of the tools. This is such an awesome feature because you never know what kind of situation you might be in during a survival scenario. Plus, you can access some of the tools without even needing to open it. The key ring attachment is perfect for keeping it within reach and it weighs only 2 ounces and 2.25 inches when closed so it isn’t too bulky to carry around in your pocket. Leatherman offers an impressive 25 year warranty, too. When it comes to the best cheap multi tool, you can’t beat our budget pick, the Rose Kuli Multi Tool. It’s made from stainless steel and has a non-stick coating to keep things from getting too messy. The handle is made of wood that’s smooth and stained to a deep mahogany color. It’s comfortable to hold onto and looks really great, too. This tool has a lot of functions: hatchet, hammer, pliers, 2 kinds of screwdrivers, double-sided poking knife, saw, knife, rasper, wrench, wire cutter, bung puller, and bottle opener. Plus, it has a safety lock to keep everything tucked away until you need it. While this one is a little too big to carry around in your pocket, it’s the perfect size to bring along in your pack on a camping trip or hike. 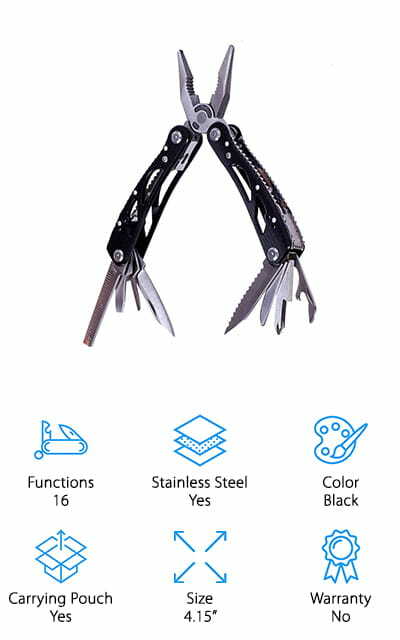 It’s no surprise that the best outdoor multi tool has Bear Grylls name on it. 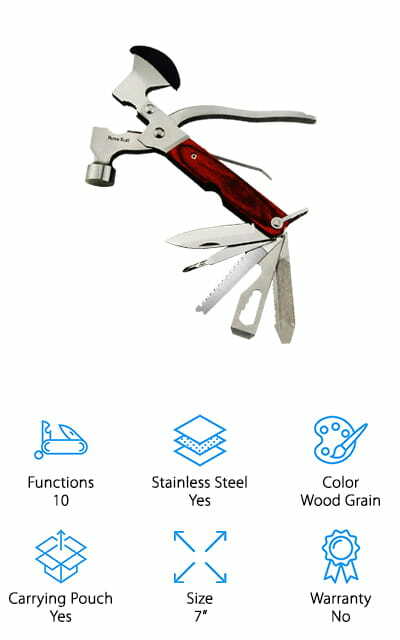 This tool features 12 stainless steel, weather-resistant tools and is ideal to take along on your next outdoor adventure. In fact, the safety lock system and compact size are perfect to take along anywhere, just in case. Included tools include needle nose pliers, a saw, 3 different screwdrivers, a can opener, a bottle opener, and wire cutters. When folded, it’s only 4 inches long and weighs just about 8 ounces. The rubber grip is comfortable and won’t slip out of your hand easily even in wet conditions. To make it as easy to use as possible, the spring-loaded jaw can be opened with one hand which is necessary in an emergency situation. It also includes a lightweight, mildew resistant, military grade nylon sheath. Here’s a really awesome tool from RAVPower. 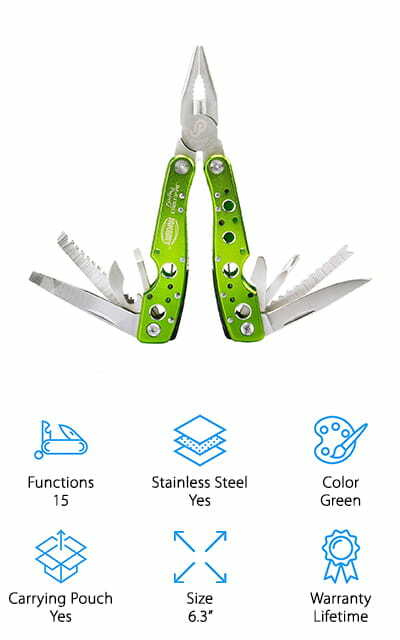 It has 6 different functions: pliers, can opener, knife/saw blade, bottle opener, and a screwdriver. And get this, it includes a 9 piece bit set so you can technically use this tool for 15 different applications. We really like that this multi-tool has built-in safety protection that prevents the blade from accidentally closing. How does it work? You have to push inwards to get it to close. The tools are constructed from durable stainless steel that’s coated in black oxide for an extra layer of protection against the elements and a sleek, stealth look. The ergonomic design is comfortable for both righties and lefties. It’s flat on both sides and has a belt clip pouch to keep it close at hand. When closed, it’s 4.5 inches long and it weighs about 8 ounces. Next up for best survival multi tool for sale is the Briout Pocket Multi Tool. It’s made of high-quality stainless steel that resists rust and corrosion and was really built to last. It has 6 different tools: spring-loaded pliers, wire cutters, saw, bottle opener, can opener, and a screwdriver. That’s not all, it even includes 11 different screwdriver bits so you can actually use it in 16 different ways for even more versatility. The aluminum handle has a nice texture that provides a great grip and adds some interesting visual details. It comes with a well-designed nylon sheath that has a velcro closure and a belt attachment. It weighs 7.5 ounces and is just over 4 inches long when folded so it’s no problem to keep it in your pocket or backpack just in case. Our best multi tool picks continue with the Jakemy Survival Multi Tool. 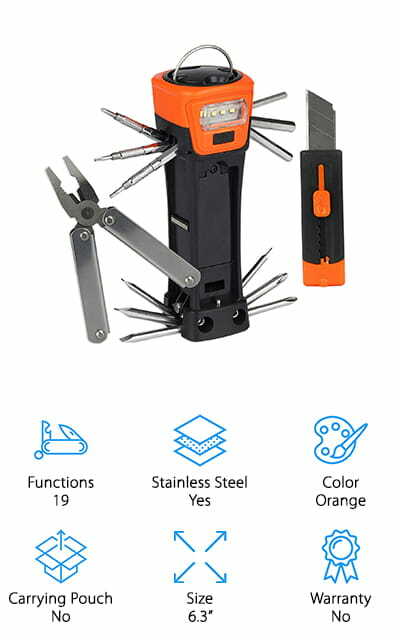 This one has a lot of different applications: flat-nose pliers, 3 different screwdrivers, a bottle opener, 2 saws, a can opener, knife filer, fish scale, ruler, wire cutters, a nail file, and a hook remover. The tools are all made of durable stainless steel while the handle is made of aluminum so it’s both durable and lightweight. The handle is also ergonomically designed with a slight arc and anti-slip teeth that fits comfortably in either your left right hand. The size is ideal, too. It’s 6.3 inches long when folded and weighs only 7.2 ounces. And that’s not all, Jakemy offers no risk purchase with a guarantee. If you have any problems using your multitool, they’ll send you a new one. 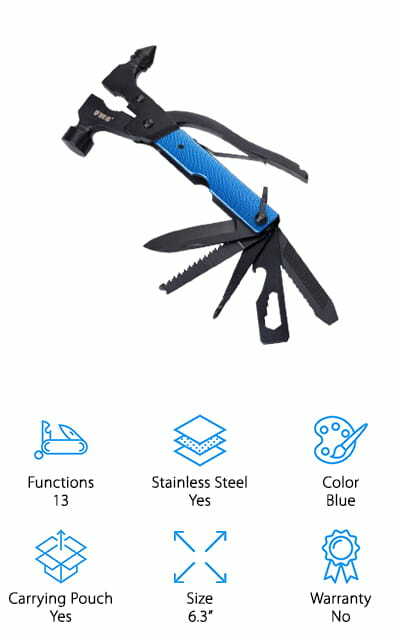 Newild has a really awesome Survival Multi Tool that has everything you need to get by in an emergency situation. It includes needle nose pliers, a mini woods saw, can and bottle opener, fish hook remover, multiple screwdrivers, a metal file, and 2 different knife blades. That’s not all, they even throw in a fire starter so you’re always prepared. The handle has a great ergonomic design that’s perfect for both left and right handed users. It comes with a safeguard switch that prevents the blade from accidentally closing. Included is a durable nylon sheath for easy carrying. This tool is a great size for travel. Folded, it’s only 4 inches long and it weighs only 12 ounces. The stainless steel construction has a black oxide coating and is super hardened and made to last. Off Grid has the next is next in our multi tool reviews and it has more functions than any other tool on the list. It’s designed with an all-steel head and sturdy full tang plus a lightweight, glass-filled nylon handle that provides superior grip and balance. 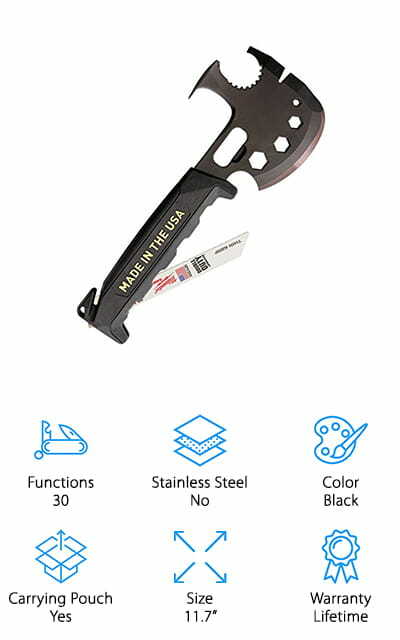 The handle is multifunctional, too, and includes a seat belt cutters and steel glass breaker, perfect for any survival situation where you might find yourself trapped in your car. One of the main features is the hatchet. It’s heat-treated, hardened, and can be sharpened when it begins to dull. This tool also incorporates a hammer head and claw, saw blade, various hex sockets, a gas valve shut off wrench, bottle opener, pry bar, nail puller, demo grip teeth, and a spanner wrench, just to name a few. One thing that sticks out about the FMS Survival Multi Tool is the dual purpose hammer. One side is flat, the other conical. 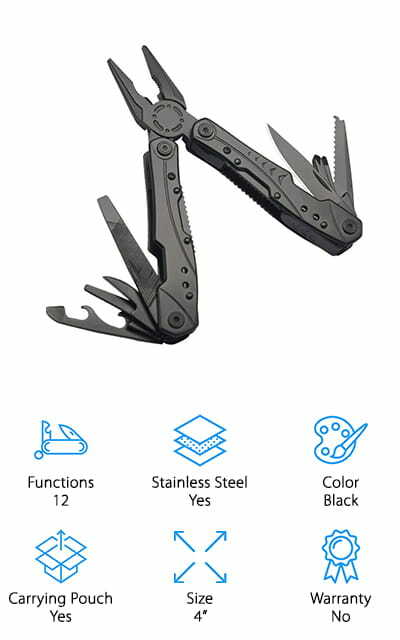 Although it’s one of the most prominent features, it’s just a fraction of the 13 functions this multi tool has to offer. What else can it do? There’s also a saw, 2 screwdrivers, a bottle opener, hook remover, knife, wrench, wire cutters, 2 different kinds of pliers, and a file. The included nylon belt patch is perfect for keeping the tool safe when it’s not in use or attach it to your belt so it’s always close at hand. 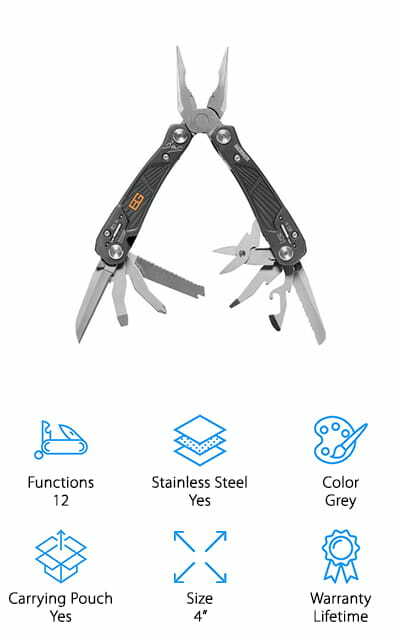 This multi tool has a lot of useful functions that you’ll need when you’re camping, fishing, or hunting but you might also find it just as useful for everyday things around the house. The last item in our multi tool buying guide is pretty spectacular. 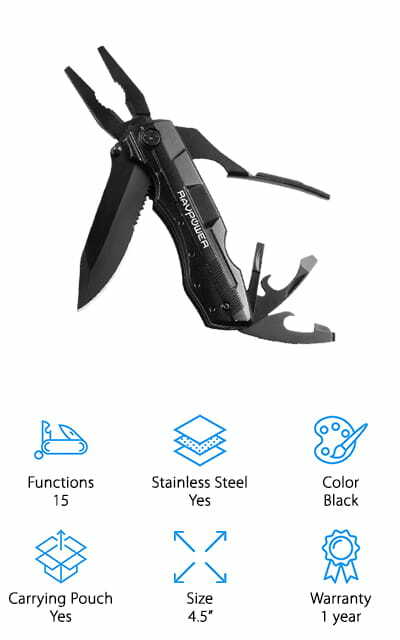 It has 19 different functions, including a LED flashlight, hammer, folding pliers, knife, as well as a handle for easy carrying. It also comes with a wide range of screwdrivers and hex keys including slotted, Phillips head, and ever a few mini ones. The pre-made hole allows you to hang this tool if you need hands free light to work. The flashlight requires 2 AAA batteries which are not included. This is the only tool in our review that features a flashlight and it really increases the versatility. Obviously, it’s a perfect tool to take camping, hiking, hunting, or fishing but it’s also a perfect option to keep in your car or to use around the house for quick and easy emergency repairs.